The whole job search process can be alarmingly stressful and the mere thought of writing a CV is enough to panic most people. Yet your CV is an incredibly powerful tool capable of opening doors and getting you interviews. If you know what you’re doing, a well-written CV can be the key to landing your dream job with relatively little stress or fuss…but that’s the problem, right? How exactly do you write a great CV? Well, it’s actually easier than you think to inject a little power into the old curriculum vitae. In fact, you can do it simply by choosing a few words that are truly potent. The easiest way to do that is to use power verbs. You’ve almost certain heard of verbs – the ‘doing’ words, the ‘action’ words. Normal verbs are an effective way to inject some momentum into your prose, but power verbs take it to the next level. They’re a form of active language I teach in my career coaching, as they’re brimming with confidence and the go-get-them attitude that will help you impress potential employers. 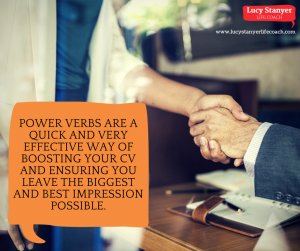 Power verbs can also increase your self-confidence when you do come to interview, helping you feel proactive in your communication efforts, and showing your skills and experiences in the best possible light. 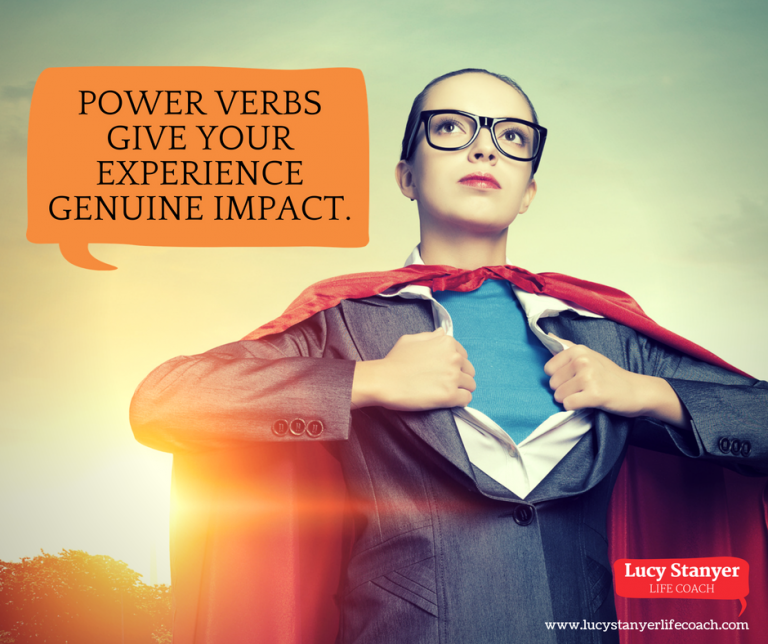 Power verbs give your experience genuine impact. They’re a quick and very effective way of boosting your CV and ensuring you leave the biggest and best impression possible. Staring at a blank page and trying to figure out how you’re going to explain your value, your worth, and all the amazing unique abilities you can bring to the table, can be a little paralysing. People often can’t see the wood for the trees. It’s really tough to see yourself in a new light, or find a way to demonstrate just how much you have to offer. As a result, so many CVs end up as a list of duties that have been done, rather than a true representation of the positive impact that has been made, the achievements that have been reached, and the roles at which you have excelled as part of various teams and organisations. Your written vocabulary is of paramount importance when you’re penning a CV. It’s literally all you have to land you that interview and make a great first impression. Power verbs allow you to say all the practical necessities that need to go into a CV in the most vibrant, specific, and powerful way possible. 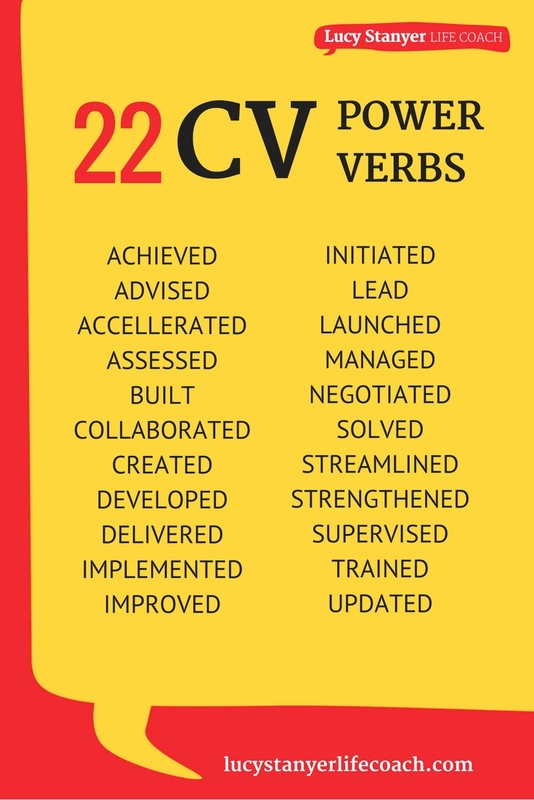 If there’s one word that is horrendously over-used on CVs it’s ‘led’ or ‘lead’. While leadership qualities are incredibly beneficial and highly sought after, the majority of people are aware of this and, as a result, CVs are littered with things people have lead. It’s a word recruiters read so often they no longer register it as a real word. It sounds sort of fake, and certainly doesn’t stand out or catch anyone’s attention. There are loads of great alternatives, depending on exactly what you were leading, but a few general staples you should familiarise yourself with are chaired, coordinated, executed, oversaw, and operated. There is also my personal favourite, orchestrated. Don’t say you led a project. Say you successfully orchestrated a project. Another word that’s become so prevalent it hardly even sounds like a word anymore is ‘increased’. Whether you’re discussing sales, revenue, or efficiency, saying you increased it is incredibly underwhelming. You want a word that captures your amazing achievement, and the extent to which you have improved things through your hard work. A simple ‘increase’ lacks a certain poetry that can be found in alternatives. One great option is ‘enhanced’, and depending on the field your working in and how corporate your tone of voice needs to be, you can also try accelerated, amplified, boosted, maximised, stimulated, or outpaced. Another great word to use in this context is ‘growth’. The business world as a whole is obsessed with growth – if it strikes the right tone, you may even try growth hacking or growth hacker! As impressive as reaching management level is, ‘managed’ is another greatly overused word on CVs. This is largely because you can manage a team or a project, without actually being a manager, and it seems obvious to draw attention to your managerial chops if you’re hoping to gain a higher position. The problem with this is that it turns everyone into managers and the word no longer carries any weight with recruiters. As an alternative, try ‘mentored’ – it has a much deeper, caring, and enlightened feel to it. And if that doesn’t quite fit, other great alternatives are guided, inspired, motivated, trained or unified. These are just a few great ways to incorporate power verbs into your CV. Check out the infographic below for more examples. And feel free to add your favourite power verbs to the comment section below! If you need extra help exploring your career options, getting your CV tip-top and finding work you’ll love, book a free discovery call today.